Normal to combination sensitive skin prone to rosacea. Care Protector for normal to combination sensitive skin and prone to redness. 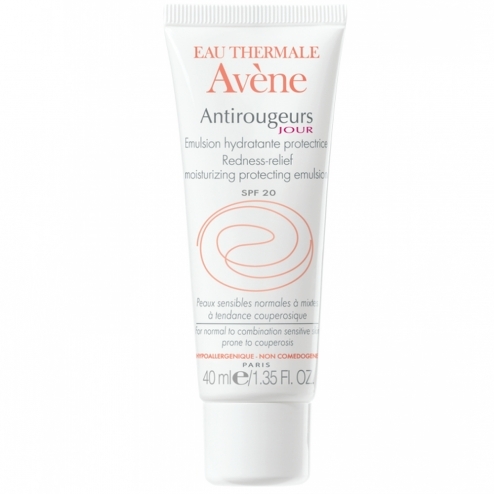 Regular use of Redness in Avene Thermal Spring Water enables the bit to regain its softness, comfort and healing they need. Diffuse redness is visibly reduced and transient redness and less frequent. The complexion becomes clear and homogeneous. Clinical evaluation after 28 days (or month) of use: patients reported a significant decrease in the intensity of flushes but also reduce their frequency. INCI formula: Avene aqua, ethylhexyl methoxycinnamate, glycerin, PEG-12, Carthamus tinctorius, dimethicone, propylene glycol dicaprylate / dicaprate, glyceryl stearate, Stearic acid, methylene bis benzotriazolyl tetramethyl butylphenol, Aqua, BHT, CI 42090, carbomer, chlorphenesin, decyl glucoside, dextran sulfate, disodium EDTA, fragrance, hesperidin methylchalcone, o-phenylphenol, phenoxyethanol, Ruscus aculeatus, triethanolamine, xanthan gum.